The LED advertising panel could not have put it more bluntly, mixing the words "готовся" and "get ready" - if it did not bear the logo of Russia's 2018-2022 World Cup bid, it would reflect what was about to happen on the pitch of Klagenfurt's Hypo-Arena. The stadium, filled nowhere close to its maximum capacity, hosted two teams that would most definitely not have met under any different circumstances. With preparations for the World Cup reaching their peak, Weiss's Slovakia and Le Guen's Cameroon locked horns in a game that was supposed to provide answers to some pressing questions. The game started at a decent pace, with Cameroon's striker Webó threating Kuciak's goal from inside the box after mere 4 minutes of play. The chance was set up by Tottenham's Assou-Ekotto, whose decent runs upfront and good crosses made him one of the best players on the pitch [Assou-Ekotto also provided an interesting insight into what makes a football player tick off the pitch]. It was, however, Slovakia that scored first, using the same weapon that propelled them all the way to South Africa. 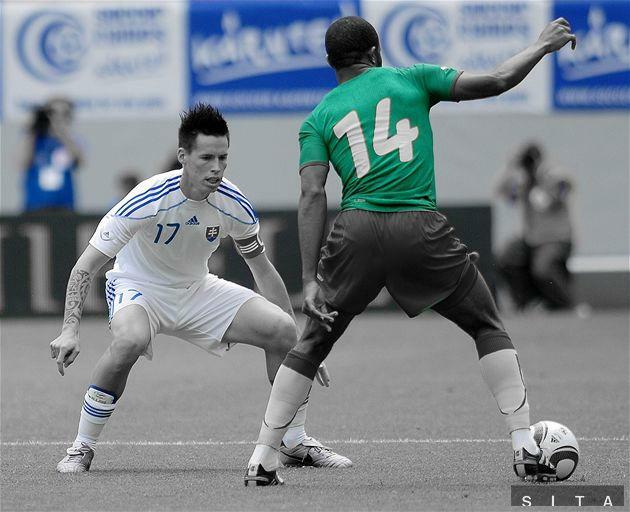 A long ball by freshly recovered Škrtel converted Cameroon's attack into Slovakia's counter-attack, Hamšík passed the ball to young Stoch, whose run into the box distracted Cameroon's defense - instead of shooting, Stoch chose to give the ball to Kopúnek, whose shot from outside the box beat Souleymanou and put Slovakia in the lead. See the goal here. Spartak Trnava's Kamil Kopúnek scored his first goal for Slovakia. Slovakia remained active and could have added another one after corners, but both Škrtel's [8th min.] and Kucka's headers [14th] missed the goal. With 20 minutes on the clock, Slovakia was pressed back and faced some pressure by Les Lions Indomptables, and Webó's shot was dealt with by Kuciak and Ďurica. Eyong Enoh and Emana failed to succeed 10 minutes later, as the game was gradually losing its pace. Just when it seemed that the first half was to end, Slovakia launched another speedy counter-attack and outnumbered the Cameroonian defense [four against two], but Kozák's pass failed to find any of his teammates and the ball ended up with a Cameroonian defender instead. Second half started with substitutions, as Kozák, Stoch and Jendrišek were replaced by Švento, Weiss Jr. and Šesták. The presence of the latter two was felt almost instantaneously - Weiss Jr. did some decent work on the right and gave the ball to Šesták, whose shot made it past Souleymanou but bounced off the underside of the cross bar and flew straight out of the goal in a manner reminiscent of that famous Wembley 1966 moment. The same duo impressed five minutes later, as Weiss Jr. stormed past Arsenal's Song but Souleymanou dealt with Šesták's shot. Just as in the first half, Slovakia slowly but surely lost the momentum and withdrew to defense, as Les Lions Indomptables threatened Kuciak's goal - Song's long-range shot was a miss [75th minute], but Cameroon did, nevertheless, equalize, with Eyong Enoh punishing some poor Slovak defending after Assou-Ekotto's cross - see it here. Kuciak injured his left knee while attempting to prevent the goal and might miss out on the World Cup. 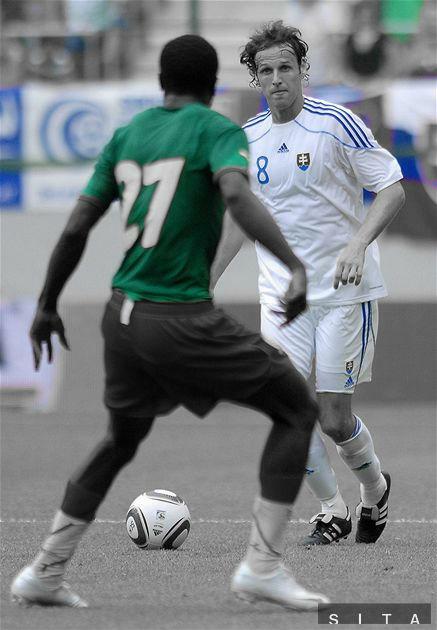 Škrtel was one of Slovakia's best players. 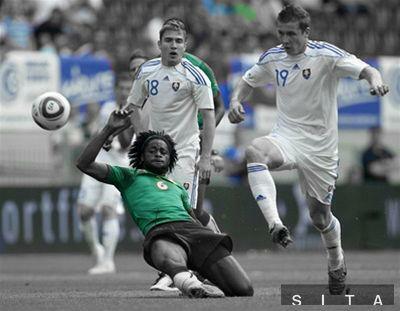 Slovakia, ranked 34th in the most recent FIFA Ranking, was an equal opponent to Cameroon, ranked 15 places above, and was not far from winning the game. It may be that Le Guen was Eto'o-less, but Weiss did not field his full team either. We can expect Slovakia to play defensively, especially against stronger sides, such as Cameroon or Italy - Weiss is extremely wary of opening up the game. Slovakia's key strength was reflected in its first goal and Šesták's disallowed goal in the 56th minute - all it takes is a single pass from the back and Stoch, Hamšík, Šesták and Weiss Jr. are a force to be reckoned with. Seeing what sort of tactics Weiss comes up with against New Zealand will be interesting - both goals against Northern Ireland, arguably a weaker team, were scored after counter-attacks as well. Another advantage of Weiss's team is its age - it is mostly composed of young players who have plied their trade in foreign leagues since very early age and have what it takes [speed, technique, confidence] to win even in difficult games - Weiss Jr. and Stoch are just 20, Hamšík 22, Kucka, Jendrišek and Pekarík 23, Škrtel 25. Kucka  should get to South Africa. The friendly against Cameroon was a sign of things to come, albeit it in a slightly different form. In an interview for Slovak media Weiss claimed that he had, by and large, made up his mind about the World Cup squad. Goalkeeper Dušan Kuciak had never been in a position to threaten Ján Mucha's monopoly on goalkeeping [Mucha has played solidly for Slovakia ever since his debut against the Czechs in Prague], and his knee injury seems to have got him out of the World Cup race for good - Ľuboš Kamenár and Dušan Perniš [many clean sheets & solid performances for Dundee United] are expected to come as second/third keepers. As far as the back four is concerned, it should remain roughly the same, with Pekarík on the right, Škrtel and Ďurica in the centre, Zabavník on the left and Čech acting as Zabavník's substitute [or replacement should he play as DM]. Error-prone Ďurica had a relatively good game, without any major blunders, while Škrtel, who had not had played a competitive game since late February [broken metatarsal], played reliably in the back and did well to put his teammates into breaks [he could have, however, tried slightly harder to prevent Eyong Enoh's goal]. Weiss commented on Čech's performace, naming him alongside Kopúnek as Slovakia's best player in this friendly. Zabavník, who was substituted on in the second half, pulled a number of great performances in the past qualifiers and should be see full action in the upcoming friendly against Costa Rica [05/06 in Bratislava]. Midfielders did not have the best of games - Kozák was far too casual, fairly immobile and his passes were poor - this game might have been his swan song as hardly any fans are keen on seeing him at the World Cup. The goal-scorer Kopúnek [defensive midfielder] should make it to the World Cup and be ready to cover for Štrba as Miroslav Karhan [Mainz/96 caps], Slovakia's most experienced player, is out with an Achilles tendon rupture - which is a real shame since he featured in every single post-1993 qualifying campaign. Juraj Kucka is a rookie and did not play any qualifying game, yet is likely to make it to South Africa, as manager Weiss praised the physical edge of his game - if he commits slightly less fouls and shoots from the distance at least as well as for Sparta Prague, he could be a worthy addition to the squad. Captain Hamšík should play as the much-needed playmaker. Things were not ideal upfront - Weiss is planning to field three men - two attacking midfielders/supporting strikers and a centre-forward. Stoch, who had an amazing season with FC Twente, will play on the left. Švento, who substituted him, is nowhere his standard and it remains to be seen whether he is truly going to make it to the final 23. Šesták, who scored most Slovakia's goals in the qualifiers, should start on the right. Weiss Jr. once again proved that he is an impact-making substitute, just as towards the end of his loan at Bolton. His explosiveness and confidence caught even Ricki Herbert's eye [NZ manager], who singled him out during his press conference [when asked about Cameroon v. Slovakia which he watched]. Weiss Jr. has, however, still a long way to go, as he needs to work on his passes, remove those unnecessary step-overs and learn to pass the ball at the right moment, making him unlikely to start under his father from the very beginning of Group F games. Weiss bemoaned the lack of centre-forwards during the post-match interview since both Hološko and Vittek were injured - the former has rejoined the training process, whereas the latter is still out with a knee injury and, just as Karhan, might not be able to make it to the World Cup. Erik Jendrišek, who played upfront in the first half, is accustomed to playing wide, while tall Martin Jakubko, a tall target-man, lacks the necessary skill as well as speed - this was made clear at the end of the game, when Assou-Ekotto, who had already played nearly 90 minutes, easily outsprinted Jakubko, who was just substituted in. His reputation with Slovak fans is extremely low and he is another candidate for a "no". Pekarík can rest assured - he is definitely in. Vladimír Weiss: "It was an excellent game against an excellent opponent. Cameroon is one of the world's top teams and we had to play defensively, otherwise we would have paid the price. I am disappointed about the conceded goal, Kuciak's injury and our wasted chance for a 2:0 lead. Kucka showed that he deserves a World Cup nomination, he is well prepared. We played without forwards, Hološko and Vittek are injured. I am sad that we did not manage to win." Paul Le Guen: "I am really satisfied with the result - Slovakia has a decent team and they showed it on the pitch. I think that our goal was well-deserved, shame that it was scored towards the end of the game. We displayed dedication, we did not give up, which is very important in the light of the upcoming World Cup. With Samuel Eto'o upfront we will be even stronger." Peter Pekarík: "We could have been even more satisfied as we played well. We were 1:0 up but conceded in the 83rd minute, something that we will have to watch out for. 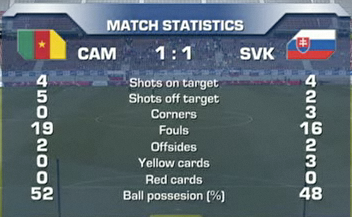 Cameroon was a real test for our defense and I think that the friendly served its purpose. Our manager told us to put some pressure on the opponent in the opening minutes, which we did, scored a goal and controlled the first half - the second half was different. 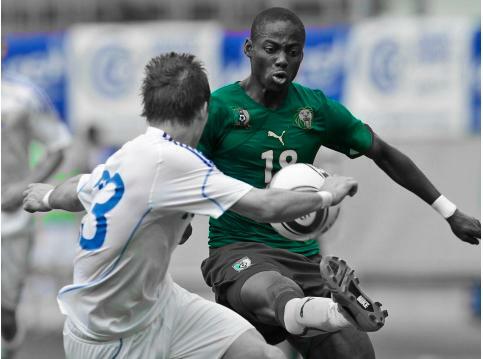 This game was physically demanding, Cameroon has physical players." Juraj Kucka: "On the one hand we should be pleased [with our game], on the other dissatisfied with the conceded goal towards the end of the match. The opponent was very good indeed and controlled the game in the second half. There are things that we still need to improve. Cameroon's players are very strong and quick - sometimes it worked and I deprived them off the ball, sometimes it did not. We had to run a lot in the second half, break down their play and be compact in the midfield, which was rather tiring." Jendrišek is not a centre-forward. Another advert that alternated with the Russian World Cup bid was by Adidas, and it repeated the well-known shred of [sports] wisdom - "Every Team Needs the Spark". Slovakia seems to have the necessary spark, and once its starting XI contains Mucha in the goal and a dedicated center-forward upfront, it would not necessarily be without a chance. Saying that, two of its upcoming opponents performed well in their friendlies - New Zealand beat Serbia [1:0] and Paraguay drew with Ivory Coast [2:2]. Group F promises to be an exciting one!